Commander Ruth Lane was commissioned in 1998 from the U.S. Naval Academy after earning a Bachelor of Science degree in Oceanography with a German minor. Commander Lane earned her Surface Warfare qualification on USS WHIDBEY ISLAND (LSD 41) where she served first as Combat Information Center Officer and then as 2nd Division Officer. She completed a tour on USS HARRY S TRUMAN (CVN 75) as Combat Systems Division Officer before transferring to the Meteorology and Oceanography (METOC) community in 2002. As an Oceanographer, Commander Lane's tours include Optimum Track Routing Division Officer, Assistant Operations Officer, and Senior Watch Officer at Naval Atlantic METOC Command; Protocol Officer and Aide to Commander SECOND Fleet; Oceanographer on USS IWO JIMA (LHD 7); Officer in Charge of Naval METOC Professional Development Detachment Atlantic; and Force Oceanographer to Commander Navy Expeditionary Combat Command. Most recently she served in the Office of the Chief of Naval Operations (OPNAV) as the Precise Time and Astrometry Requirements Officer for the Oceanographer and Navigator of the Navy (N2N6E) and then as an Information Warfare Operational Analyst in the Assessment Division (N81). Commander Lane earned a Master of Science degree in Physical Oceanography from Old Dominion University in Norfolk, Virginia and completed Joint Professional Military Education Phase I through Naval War College. Additionally, she completed Masters-level certificates in both Anti-Submarine Warfare and Space Systems through Naval Postgraduate School. 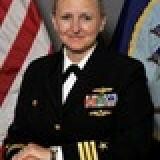 She earned her Information Dominance Warfare qualification in 2010. Her personal awards include Meritorious Service Medal, Navy-Marine Corps Commendation Medal (8), Joint Service Achievement Medal, Navy Achievement Medal (2) and various unit and service awards. Check out the incredible speaker line-up to see who will be joining Commander Ruth.